Livistona chinensis is also known as Chinese fan palm or Chinese fountain palm. It is sometimes named Latania chinensis. As suggests its common names, it is native to China. 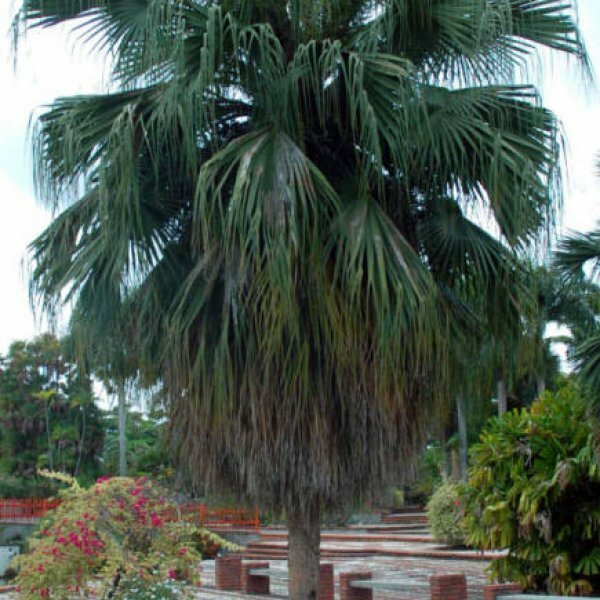 The Chinese fan palm may reach 50 ft (15 m) tall, but is generally smaller, with a more modest size of 20-30 ft. (6-9 m) It has a smooth grey stipe, and a dense canopy made of slightly drooping palmate leaves. This palm is a medium grower, especially in temperate climates. It will withstand negative temperatures of 20-15°F (-7 to -9°C) for brief periods. It thus can be grown in USDA zones 9 and warmer, and may be grown in warmest places in zones 8b. The Chinese fan palm has an evergreen dense canopy, made of palmate leaves that can be up to 5 ft (1,50 m) long. These leaves are made of leaflets that are slightly drooping, and that give a graceful aspect to this palm. 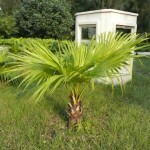 The Chinese fan palm has a yellow-cream inflorescence. 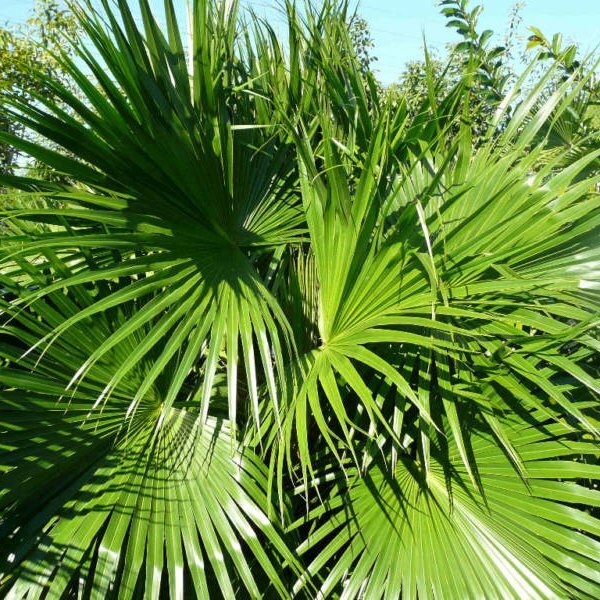 This palm has blue fruits that are about 1 in (2-3 cm) long. Prefers a well-drained ground. It will withstand occasional droughts. Germination Soak in warm water for 1-3 days. For sowing, use peat, coco fiber, or similar media. The mix should be moist but not wet. Mix the seeds with the moist compost and place into a clear plastic (ziploc) bag, and seal. No light is required for germination. Keep in warm place. Check weekly for signs of activity by looking for white roots through the plastic. Ensure that the medium does not dry out. The seeds can take anywhere from 2 weeks to 2 years (or more) to germinate; however, most will sprout after 4-6 weeks. 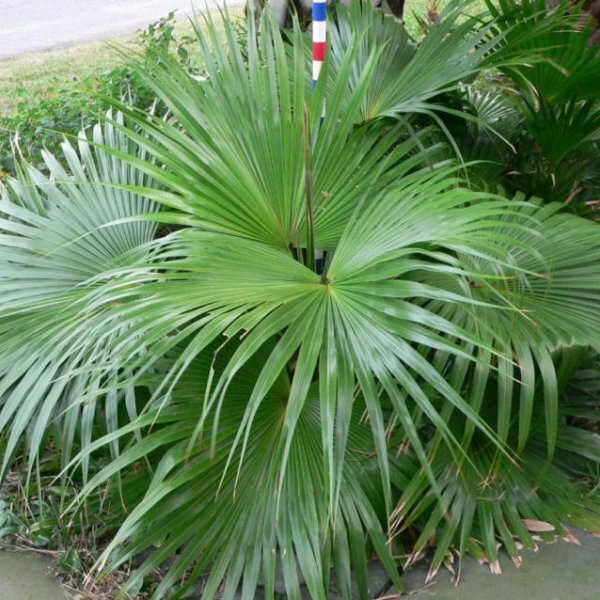 After the seeds have sprouted, plant each in a tall, narrow pot using a well-drained medium, and place in ample light, but not in full sun. Aim to keep the soil moist (but not wet) at all times, feed and pot on as required.